Just regular folks. : Dresden plate, mending, no school. 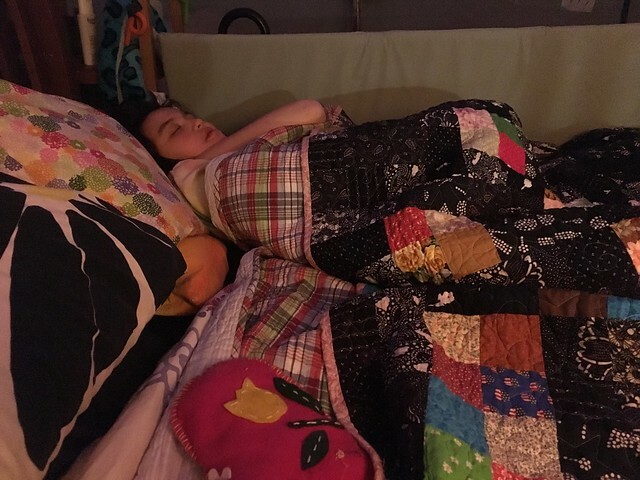 Between Christmas & New Years, I got one of my quilts back from the quilters. 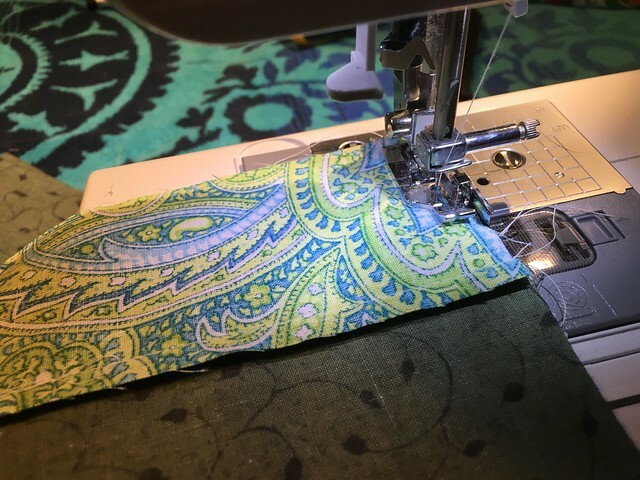 I make only the top of the quilt and then I send it out to a quilting company and they put in the cotton batting, overlay the backing and then do the machine quilting. They also put the edging (binding) on it for me. 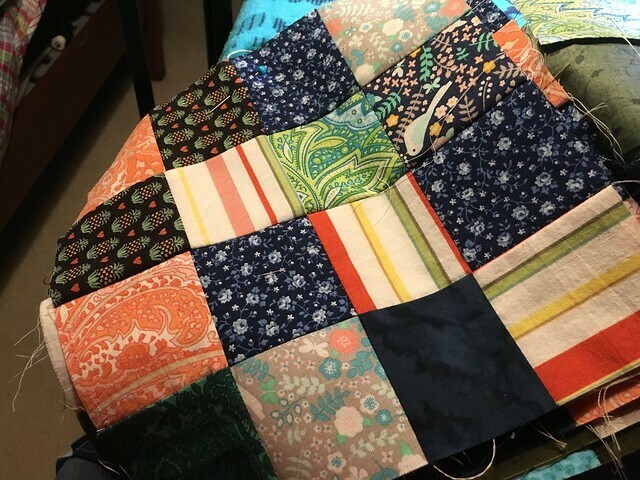 This is my third finished quilt, I average a quilt every three months or so, which I think is a reasonable pace. 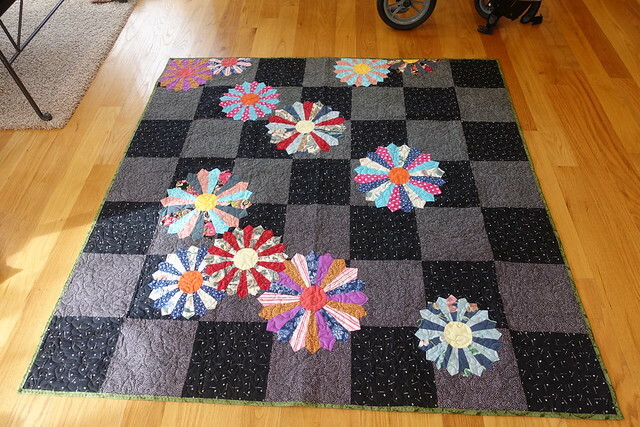 I quite like this quilt - the flowers (Dresden plate in the quilting vernacular) were the interesting part. It can be tedious - the making of the flowers - but somehow I find the tedium relaxing. Sometimes I consider it my own form of meditation. When we were in Charlottesville, I saw a beautiful $13,000 free motion quilting machine which would enable me to quilt my own quilts. I'll work up to that. Maybe. This quilt was for my parents. Tonight, Edda was happily laughing when nine o'clock rolled around and I relieved Adriana from sitting with her in her darkened bedroom. Usually Edda is asleep at 9 pm, but not tonight. There was a big smile on her face, happily asking for me to hang out with her for a few minutes. I turned on the light to my sewing station which is in her room as I had some household sewing to do. One of Edda's Velcro straps on her orthotics had split in two and needed repair. I found one of Vince's T-shirts from Japan needed mending at the neckline. I did these while Edda laughed (loudly at first and then more and more quietly) and settled into sleep. There is no school tomorrow, it's the end of the semester and teachers are tallying the last of the grades. Vince is going to go try for his learner's permit. And then my parents will come over for dinner.